Here’s a close look at the real deal… two brand new stencils right off the laser cutter. In the first video I show how they look when they arrive – all wrapped up in their protective paper coating. The coating peels off easily and leaves no sticky residue. The paper is needed for the manufacturing process so that the laser has something to work against. The stencil is clear, so without it the laser light would mostly pass through. The stencils have a slightly smoky smell, kind of like a cross between paper and camp fire. It doesn’t smell like bad or like burned plastic at all. Once the paper is gone the smell dissipates and forgotten. Once the paper is removed the stencil is immediately ready to use. The second video shows the quality of the stencil up close. It’s nice and thick, 3mm. The laser cuts and etched text labels are precise and crisp. They measure 7″ by 7″. All the shapes on the stencils were carefully selected from a slew of prototypes I made throughout 2017. I had initially offered six stencils and refined those down into these two designs for ease of use and lower cost. I’m actually giving away a set of the original six stencils in July… you can find the stencil giveaway here. Stencils are a great way to draw designs fast. They aren’t limiting in any way. They act as guides to help us get ideas down on paper and iterate fast. What is it they say in the online world? Fail fast… it’s better to know if an idea or design will be successful quickly so we don’t put too much energy into something that isn’t going to work well. As each of us designs our own tiny dream home we want to know quickly if a design will really work for us – so iterating often and early is essential. But iterations can take a lot of time and be expensive, especially if you’re working with a professional. An alternative is to DIY your design at the start and land on a plan that works for you before the investment is too great. The successful paper prototypes can then be taken farther with less risk and more potential for nailing it… pun intended. That’s the real reason I’m making stencils. For 10 years I’ve been inspired enough by the tiny house movement to put myself out there and offer plans and ideas to folks who also want real freedom from debt and mortgages. So anything I can do to help people make their dreams come true is what motivates me. For example, there’s a fellow who’s building one of my designs right now, the Philo. He, ‘Tiny Effort’ regularly sends me photos of his build. The process is slow and steady, but it’s really taking shape now. Every time he sends me those photos it’s a real boost because I know that something I put out there is making a positive difference in someone’s life. Thanks Tiny Effort! I think we all do this for each other every time we connect – and that’s what’s so amazing about the tiny house movement. It’s a real international community of like-minded people working independently but together toward improving their situations and finding real freedom. I’m glad to be apart of it. I hope that the stencils I’m making inspire people in the same way my house plans do. I hope it empowers you to rapidly prototype your dream tiny. If you want a set of stencils to play with… they begin shipping in August. I’ve launched a Kickstarter Campaign to raise the funds to place a large order to get the lowest pricing. 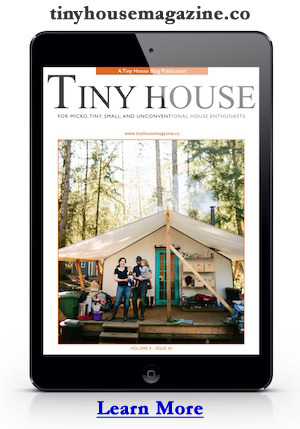 You can find the Tiny House Design Stencil Kickstarter Campaign here. Above is the exterior stencil which is good for drawing the walls, roof, trailer, doors and windows. Below is the interior stencil which is good for floor plans. They measure 7″ x 7″ and laser cut an etched from 3mm clear acrylic. After the Kickstarter campaign is complete I’ll do a metric version and offer them to folks internationally. So don’t worry… I’ve not forgotten about the rest of the world. Stay tuned for news of the metric stencils. This entry was posted in Stencils and tagged Campaign, design, drafting, drawing, kickstarter, stencils, tiny house.